Thanks to all of the advertisers that make this Guide possible!! This Guide is created by "The Business Connection" in Fairplay, CO; located at 1150 Castello Avenue. If you would like more copies or information on advertising in our 2017 publication, please contact us at (719) 836-1919 or send us an E-Mail. Founded in 1870, at an atltitude of 8,200 feet. Florissant, the western hub of Teller County, is a small, rural community located near the intersection of US Hwy 24 and Teller County Road 1. Florissant was incorporated in 1891 until the late 1930s and still has a functioning central water and sewer system. Florissant has established restaurants and retail stores in addition to a national chain hardware store serving builders and homeowners. Native American peoples known as the Tabeguache Ute Tribe traversed through the area during seasonal passages or while journeying along a spiritual path in a vision quest to Tava (meaning sun), the mountain now known as Pikes Peak. In 1852, a notable event was recorded by the adventurous mountain man and "free trapper" Kit Carson, who witnessed a fierce battle between the Ute and Comanche tribes against the backdrop of Fortification Hill, now the site of downtown Florissant. Following the mountain men who trapped fox and beaver, pioneers homesteaded the area and tamed the rugged terrain into potato fields and cattle ranches. In 1870, Florissant was founded by James Castello, a prospector, merchant, and public servant who established a very successful trading post, naming the settlement after his Missouri hometown. When the Colorado Midland Railroad standard gauge train continued west up through Ute Pass, Florissant's economy flourished as an early supply point during the 1891 rush for gold in Cripple Creek. Supplies destined for the mining district were shipped by rail to Florissant and then moved by wagon to Cripple Creek and Victor. In the early 1900s, the Midland Railroad brought trainloads of tourists to Florissant to gather wildflowers and to collect local mineral specimens and fossilized wood. Due to improving internet availability, many telecommuters are moving to the area full time to join retirees and seasonal residents. James Castello and many other early pioneers still reside in the Florissant Pioneer Cemetery just southeast of town. Florissant had its "15 minutes of fame" when our Mayor Paco, a donkey, was featured on the Martha Stewart TV show. Recent episodes of the Weather Channel's "PROSPECTORS" show featured cast members from the Florissant area showcasing high quality mineral specimens found in Florissant. The Gold Belt Scenic Byway - Follows the Hundley Stage Route and traces historic stagecoach and railway travel routes to the Cripple Creek and Victor Mining District and communities of Florence and Canon City. 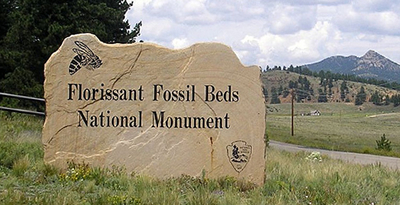 Florissant Fossil Beds National Monument - The 6,000 acre Florissant Fossil Beds National Monument offers 14 miles of hiking and horseback riding trails.